As part of my home blog, I often describe visit to plants, factories, and ships in the “Technology Series“. Over the years, we’ve covered mining truck manufacturers, sail boat racing, a trip on a ship-assist tug boat, a tour of Holland America’s Westerdam, a visit to an Antarctic ice breaker, a tour of a Panamax container ship, and many others. I’ve even had opportunity to operate a 5,000 hp tractor tug, dive 600 feet below the surface on a nuclear-powered submarine, and drive an a 80,000 lb payload six-wheel-drive mining truck. 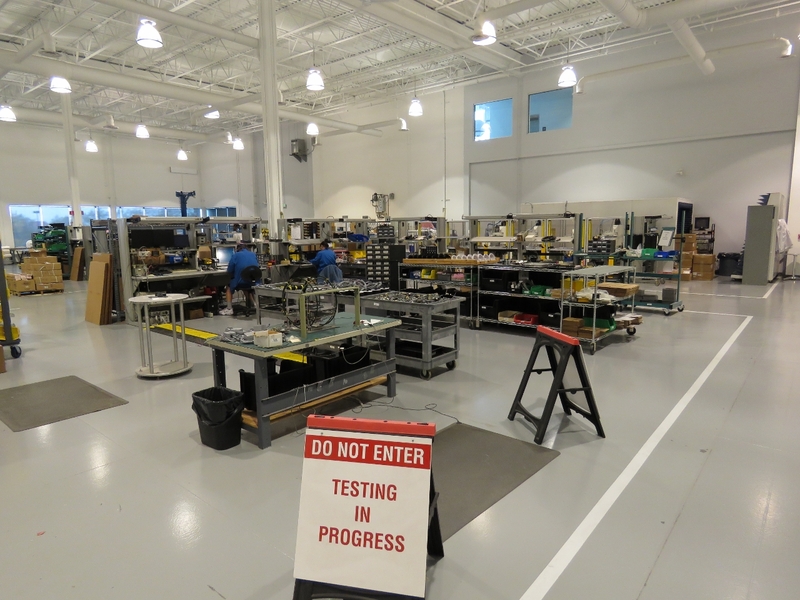 This current post is a tour of the R&D facility and factory for KVH Industries, a satellite equipment manufacturer. It’s potentially of interest to you folks, so I’m posting this one here as well. 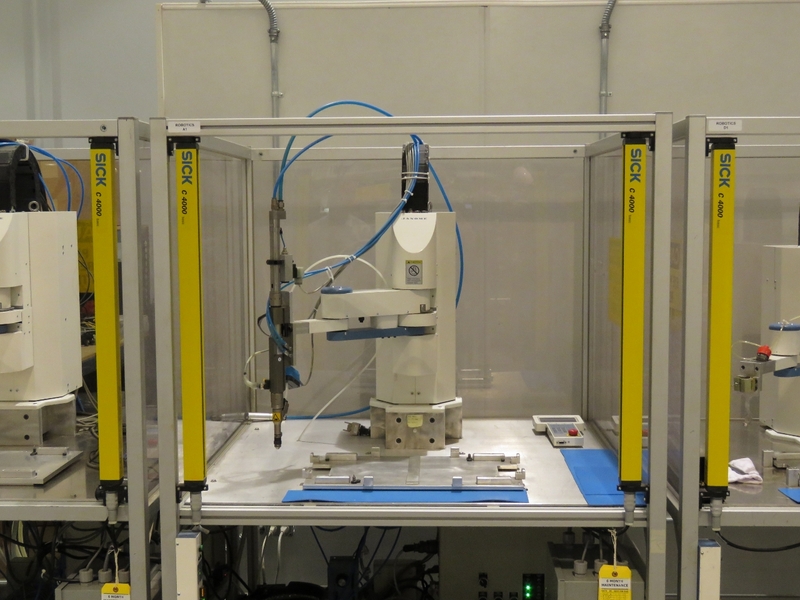 In this case I’m actually a user of some of the equipment being manufactured. Since I work full time from a boat and am often away from terrestrial communications options, I’m a big satellite service consumer. 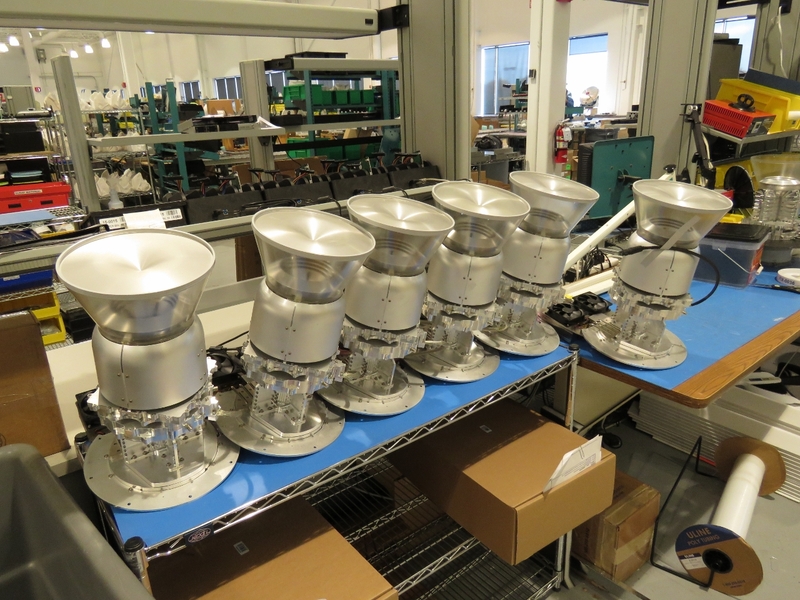 That made the visit to KVH Industries in Newport, Rhode Island particularly interesting. How do they manage to make two-way satellite communications actually work from a boat rolling around in six-foot seas? 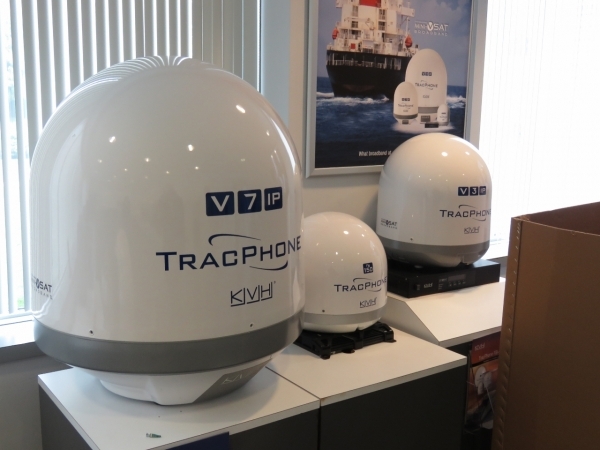 The KVH V7 mini-VSAT broadband system is the primary satellite system on Dirona, providing high-speed communications at more affordable prices than other satellite offerings. Admittedly, it’s still two orders of magnitude more expensive than cellular data, but cellular is not an option away from dense population centers and the V7 system is still only 1/30th of the cost of our backup satellite communications option. 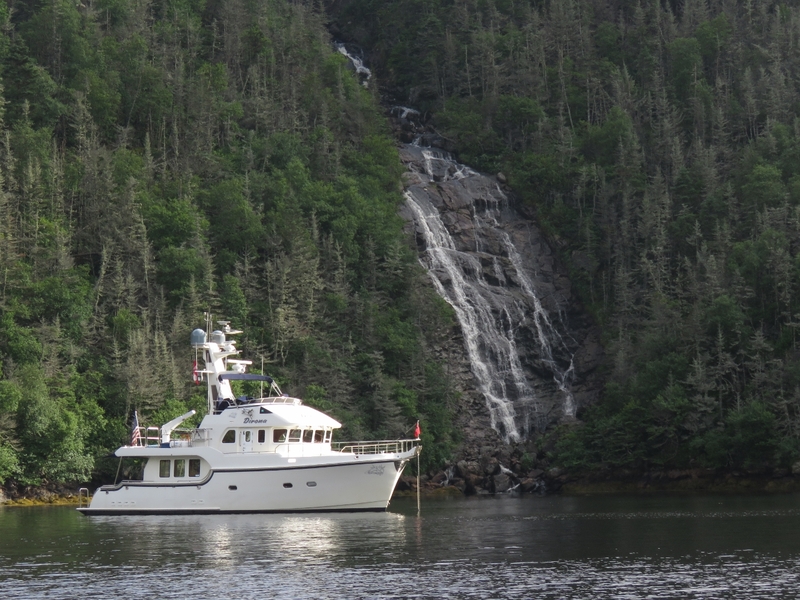 That near two orders of magnitude cost advantage is why we installed a mini-VSAT system and it’s why fleet operators and fish boat captains make similar choices. Ku-band mini-VSAT was much more affordable than the alternatives when we started using it back in 2011 and it remains so today. Understanding our dependence on the KVH mini-VSAT system and our interest in technology, it’ll come as no surprise that when cruising south past Rhode Island, we jumped on the opportunity to tour the KVH headquarters and factory. 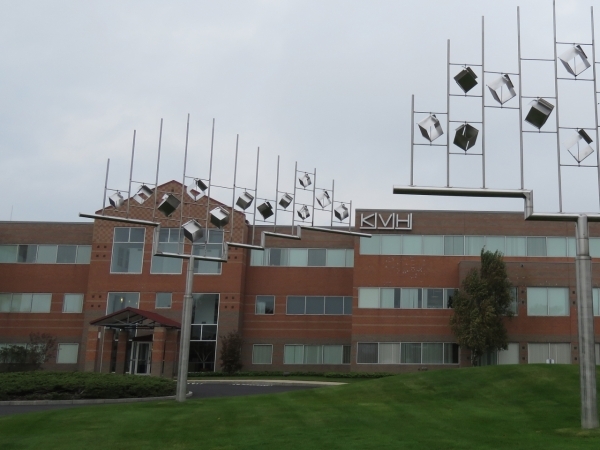 KVH has co-located their headquarters, R&D facilities, and factory in a single location in Middletown, Rhode Island. 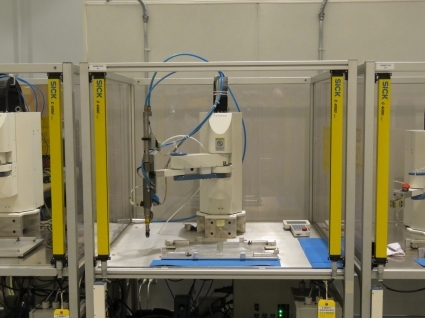 Having R&D facilities on the same campus as the factory allows new designs to get to market faster, manufacturing problems can be resolved more quickly, and customer feedback finds its way back into product updates rapidly. The common industry experience is that you first select a satellite service provider, then purchase compatible equipment, then pray your installer is good and able to make it all work together. With complex equipment that has to be able to find a satellite at least 22,236 miles away in space while on a boat in rough seas, things will go wrong and you will eventually need expert help. When cruising between regions, different providers require different configurations and, again, you are highly dependent on the skills of the local installer. Like many satellite dish hardware manufacturers, KVH started making antennas and base stations for a wide variety of satellite services offered by multiple service providers. Some years back KVH made what appears to have been an excellent decision. 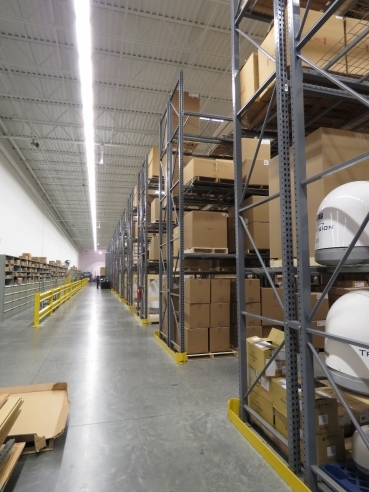 Rather than just selling mobile communications equipment, they elected to offer a full service where customers could purchase the equipment, world-wide satellite connectivity service, communications contracts and full customer support as an easy-to-install single package. We chose it for Dirona because it was the best value system we could find but, over the years, what we really came to love is KVH keeps it working, it’s been reliable, and we’ve not had to switch communications vendors or service providers as we traveled around the world. We are just as focused as ever on keeping our satellite communications costs under control but we’ve learned it’s even more important to keep it running. 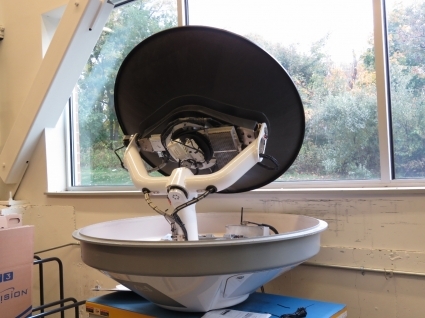 Thousands of hours and five years later we still depend upon the same solution and, as technology advances and space lift costs drop, the mini-VSAT system remains the most economic solution for marine applications. KVH was founded as Sailcomp back in 1982 by Arent Kits van Heyningen and his sons Robert and Martin. 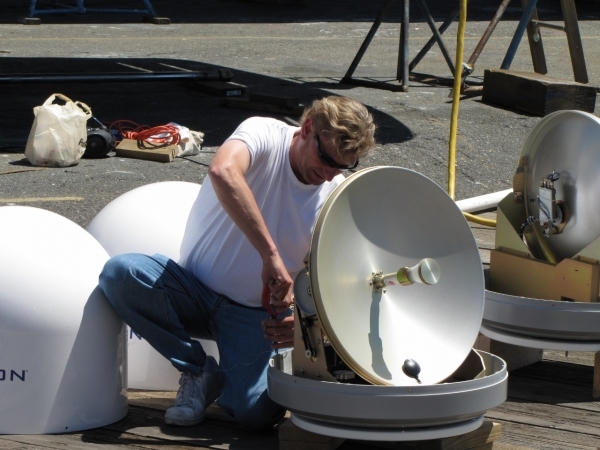 Their initial product offering was a digital compass for use in racing sailboats. 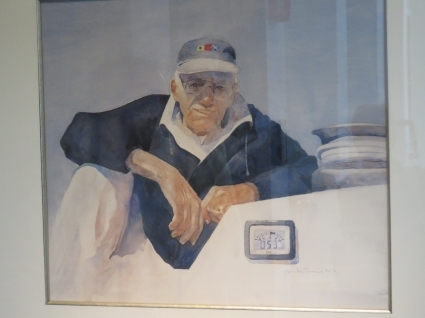 Nearby Newport, Rhode Island was at the time a hot-bed for racing sailboats and, although America’s Cup racing no longer takes place there, sail racing remains an important part of Newport. 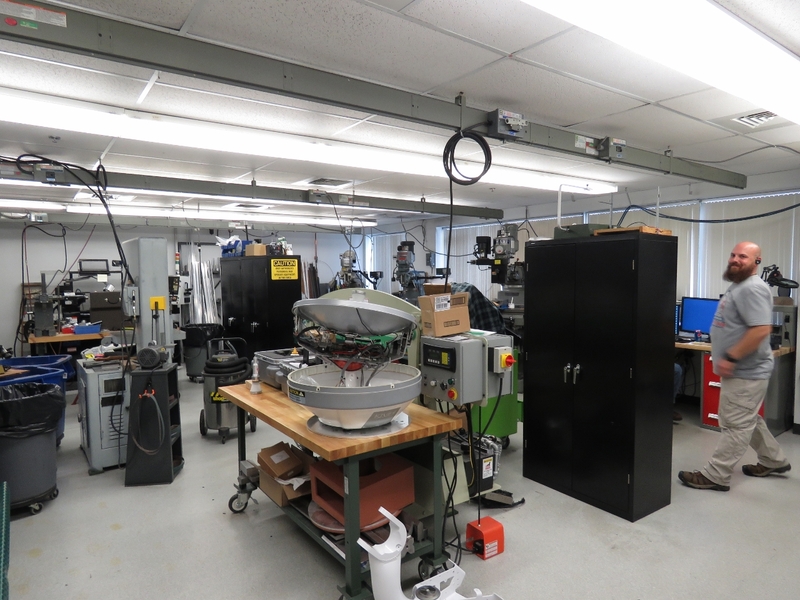 KVH has evolved to focus on satellite communications/guidance and stabilization for both military and civilian applications but, while walking through the factory, the descendant of the original KVH product line remains a part of the now much broader product line. The painting above of Arent Kits van Heyningen, who died in 2011, is displayed prominently at the KVH facility. A plaque underneath reads “Arent Kits van Heyningen; Founder of KVH Industries; Inventor, Colleague, Mentor, Friend; Presented by KVH Employees 2006”. KVH developed the TracVision satellite television system back in 1994 but the important development for us was delivered in 2007 when their mini-VSAT system was first deployed. We purchased our V7 system in 2011 which you would think would be early days of that product line but, by 2012, this product was already the marine telecommunications market share leader. I have called the KVH customer support team and, for anyone who has called a telco support center, you know that the experience of calling support is seldom uplifting. KVH is an exception. The support team is knowledgeable, has detailed access to the world wide system state of health, and can drill into each customer’s system and get real time performance data. 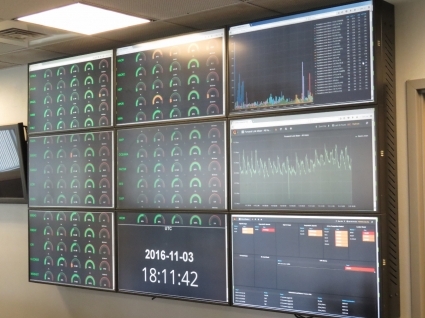 The picture above on the left shows the Network Operations Center display of the current state of the health of each satellite transponder. A quick glance will determine if any are down or running excessively hot. Near this display is a view of the global KVH world network and every antenna on that network. They can see where each system is in real time and can drill into any specific antennas to see vital statistics on the system and its current operating parameters. As an example, they pulled up Dirona and showed the operational state of our antenna. Nothing improves customer service faster in any industry than empowering the service team with real data and both allowing and expecting them to help customers. 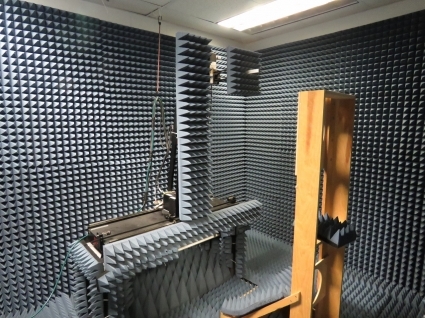 Above are testing facilities for the satellite equipment. On the right is an Anechoic chamber that absorbs reflections of either sound or electromagnetic waves. KVH also uses uses a fully grounded steel enclosure for electromagnetic emissions testing. The first two pictures above were showing us upgrades to the V7 system since ours was purchased five years ago. 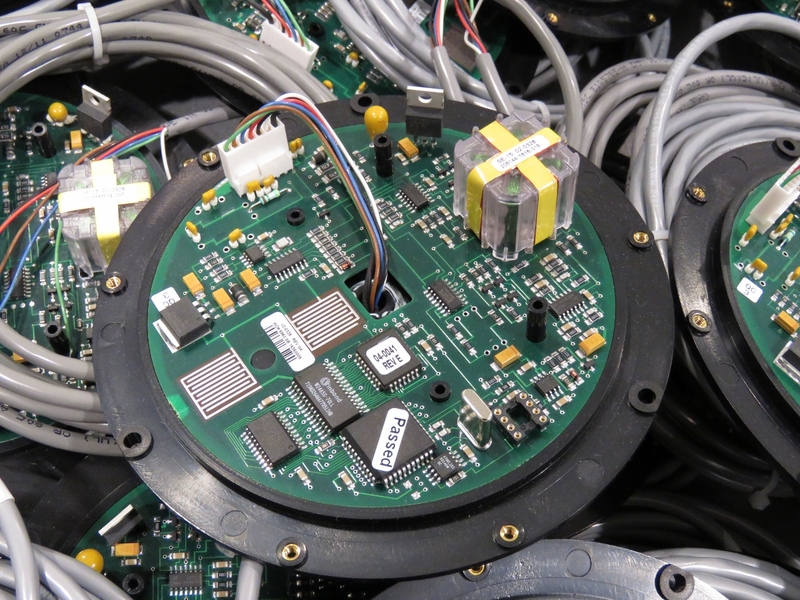 Most notable is that the two-box Antenna Control Unit and Modem assembly installed on Dirona have been reduced to a single 1RU component with additional features including a new control processor that will capture key metrics or the entire system log to help debug problems. The third picture is a low profile antenna based upon a phased array sensor for use on recreational vehicles where height restrictions prevent the use of a full antenna dome. 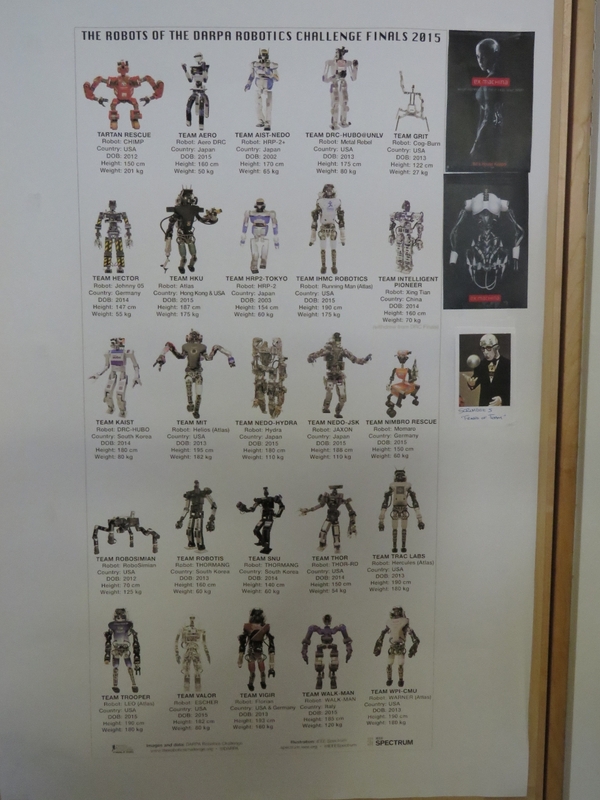 A couple of displays caught our interest as we toured the facility. The exhibit at left above features various KVH TracPhone and TracVision antennas, including a V7 TracPhone similar to ours second from the top on the right. The poster on the right above is from the 2015 DARPA Robotics Challenge. The winning team and 11 of the 23 finalists used a KVH 1750 Inertial Measurement Unit in their navigation and stabilization systems. 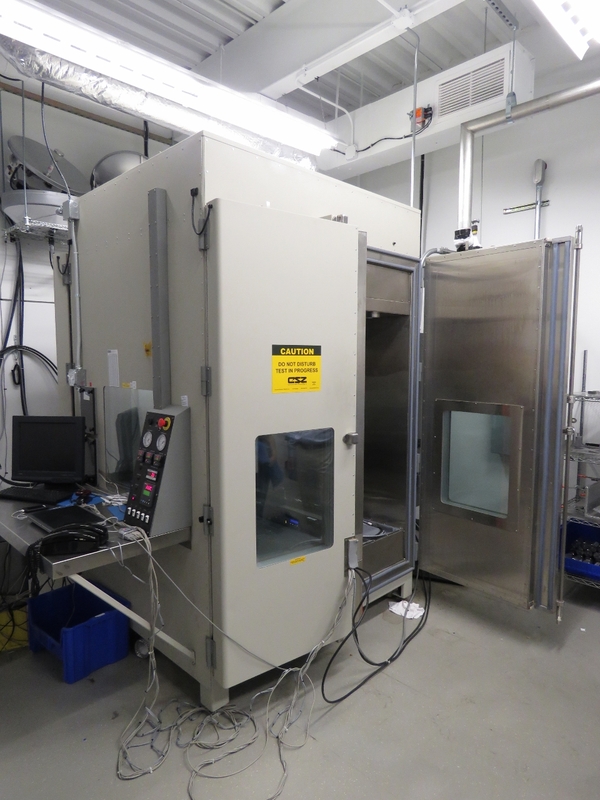 The first picture above shows an environmental chamber for electronics testing where KVH can take the entire system to high temperature and low temperature while vibrating and running source voltage levels up and down. The top picture on the right is one of the robots used to assemble the phased array sensor for recreational vehicles mentioned earlier. The bottom right picture is the original KVH electronic compass used for sail racing that still is manufactured today. In pictures of Dirona, you can see two medium-sized domes high up in the mast. 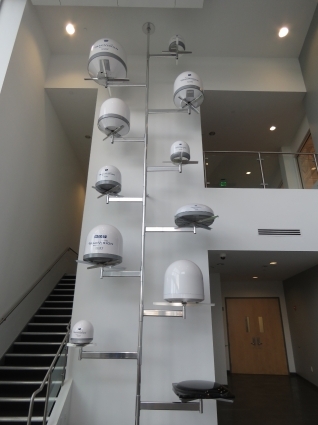 The port dome is a KVH M7 satellite TV system and the starboard dome is a KVH V7 mini-VSAT system. The two domes don’t look that big near the top of of Dirona but, when standing beside the 24″ dishes, they look positively enormous. In the picture above, Jennifer is standing beside the larger V11 and it’s truly a beast. 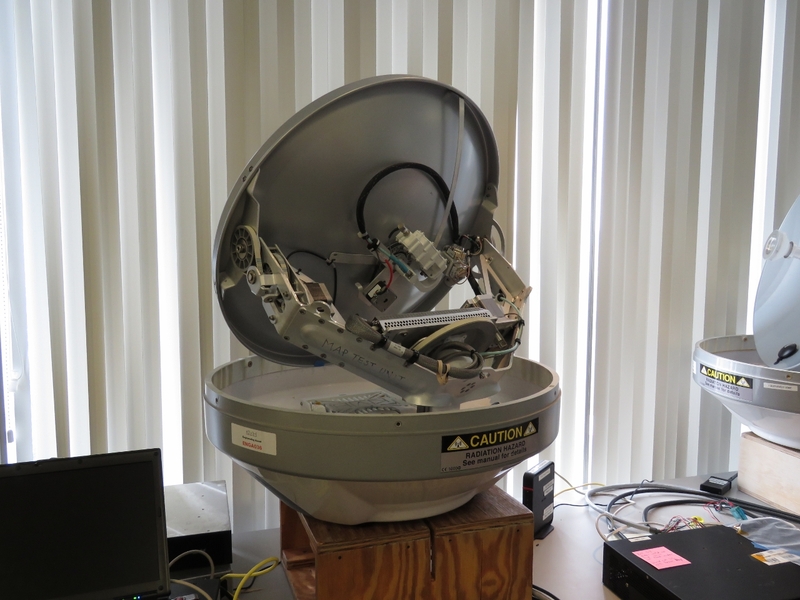 The V11 provides dual-mode C/Ku-band capability and is gigantic at 42.5″ and 240lbs. 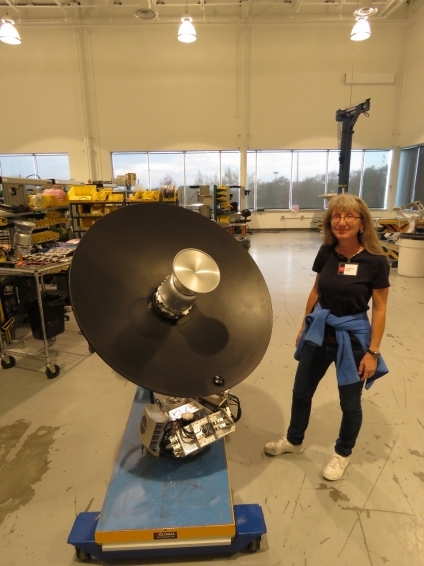 Ironically it’s a break through to get both C-band and Ku-band in such a small package even through it’s still bigger than Jennifer and heavier than I am. 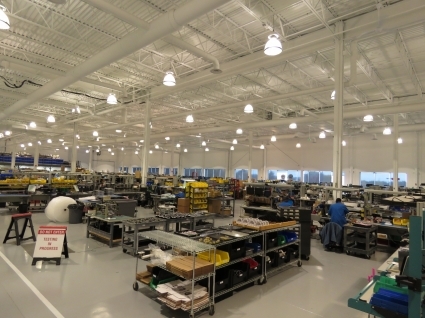 The leftmost pictures above shows the final assembly and test facilities. 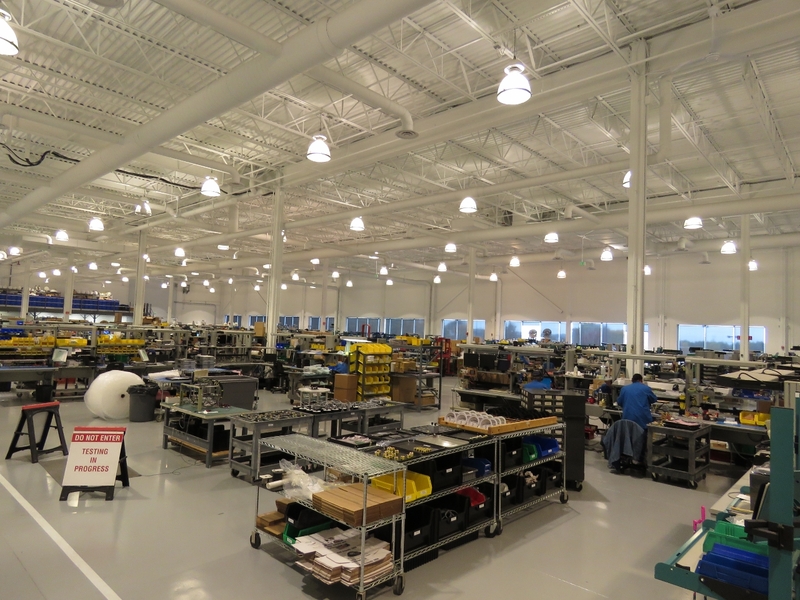 On the right is the integrated warehouse where all components coming into the manufacturing plant flow and all finished goods exit. KVH Industries is my kind of company in that they seem to specialize in taking useful but very expensive solutions and innovating to make them available far more broadly at much lower cost. The companies best at applying this model don’t sublet their R&D work, they have their own software teams, and deeply integrate R&D, manufacturing, and customer support. KVH is a great example of doing this right and I learned a lot from spending a day with the team. Sorry to come to this so late. As you know I admire and read your blog but can’t read it all at once! 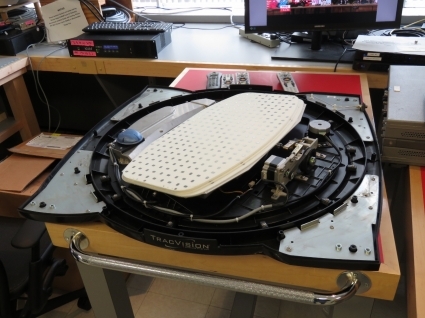 In talking to KVH did they mention the planar array being worked on by Kymeta (and eSystems I understand). I only became aware of them early last year and have been fascinated by its promise ever since. I’m an old RF and gyro guy hence my interest. They certainly have impressive corporate support and some big name trial boats. Having just read t his entry I couldn’t help but wonder what impact such a profound tech change would have on KVH hardware (and on its cost). Did it come up in conversation while you were there? Poking around this blog, after the Four DB2s post. Very interesting to see this post — I went to grad school (McGill) with Rob KVH. He commuted back and forth between McGill and Newport in his very fast car. He routinely adapted pretty exotic technology into shipping products (pun intended), working with 8-bit CPUs and no OS, programming at a very low level. Very capable guy, very cool company. I agree that KVH is a very cool company. It’s their innovations that keep me connected and have allowed me to keep working as we cruise the world in a small boat. We just installed their latest innovation the V7hts. 10Mbps in the middle of the ocean is pretty amazing! You sound like a pretty serious sailor. 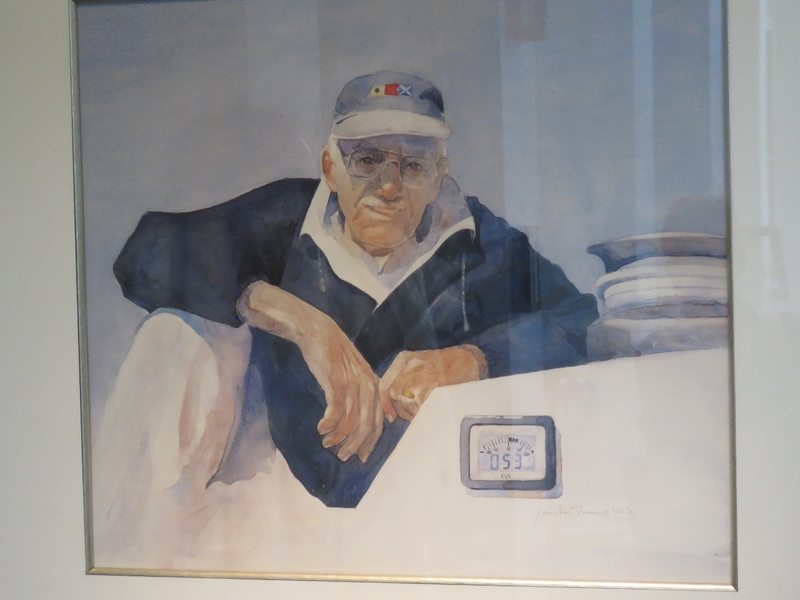 Did you ever work with Jim Gray, and is your interest in sailing somehow related to his? Yes, I knew Jim well and we worked closely together at many times over a decade and a half. It wasn’t Jim that got us interested in cruising the world but we talk occasionally talk boats. Jim was a mentor and a role model and I still miss him massively today.